Native American Indians were a deeply spiritual people and they communicated their history, thoughts, ideas and dreams from generation to generation through Symbols and Signs such as the Wolf Tracks symbol. Native American symbols are geometric portrayals of celestial bodies, natural phenomena and animal designs. The tracks of an animal, such as a wolf, were used to indicate a direction. The meaning of the Wolf Track symbol was to signify the presence of wolves in the area and indicate where they had been found, or the direction they were taking. The meaning of the Wolf Tracks symbol was to symbolize direction and leadership and embodied both protection and destruction. The prey of wolves included deer, elk, moose, beaver, cattle, sheep, horses and dogs. However, wolves were generally revered by tribes that survived by hunting, but were thought little of by those that survived through agriculture. Native Indians acquired excellent tracking skills which enabled them to find and hunt the animals used for food, clothing, and tools. The Native Americans learnt how to identify wolf tracks which could easily be mistaken for those of the coyote. The track of a wolf is considerably larger than a coyote. The front feet of a wolf are larger than its hind feet and its toes spread more. The length of the stride was also an indicator of the identity of an animal's track. Native Americans searched in soft mud or wet sand near water for animal tracks as these held tracks well and often yielded clearly identifiable prints. 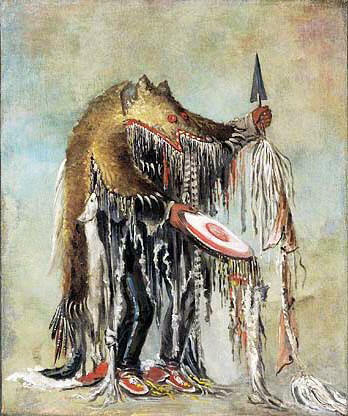 Many Native American cultures feature skin-walkers or a similar concept in which a Shaman or Medicine Man may, according to cultural tradition, take on an animal form such as a wolf. The picture below illustrates a Medicine Man of the Blackfoot tribe taking on the animal form of a bear.